This is another super-quick and easy card that I made with the Memories & More Merry Little Christmas card pack. Memories & More card packs are not just for memory keeping! 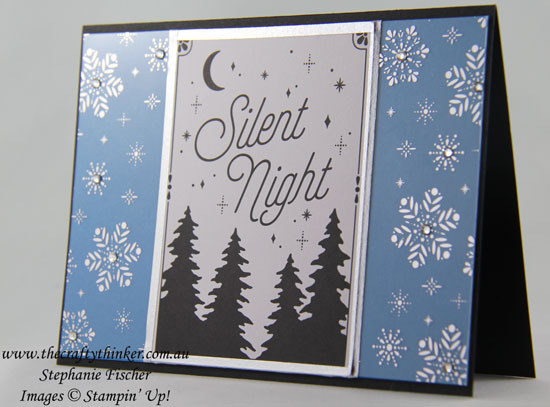 I layered the acetate sheet with the silver snowflakes onto a piece of Pacific Point cardstock, positioned the Silent Night card and stuck it down with silver washi tape from the Year of Cheer Specialty Washi Tape pack. Then I simply adhered that to the front of the Basic Black card and added some Rhinestones.